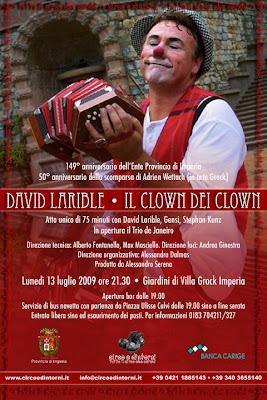 And congratulations go out to Maestro Larible on his July 13th extraordinary performance at Grock's legendary Villa in Oneglia (Imperia, Italy), just fully restored, for the 50th anniversary of Grock's death. 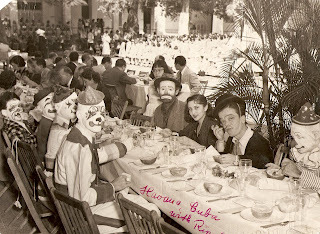 Emmett Kelly, Lottie Brunn, unidentified and Charlie Bell. My friend Steve "Etienne" McGinley. "The Psychologist" from The Danny Kaye Show which ran Wednesday nights on CBS from 1963 to 1967. I watched the parade last night, in the comfort of my own TiVO, and was glad to see Bill and Michele Machtel, Trisha Manuel and Keith Crary all get some screen time. I was also glad to see Mr. and Mrs. JRN II getting the royal treatment in their horse drawn carriage. Has anyone heard anything about the shows? The video doesn't begin until 1:20.